The specs say the 12x-mini-i can handle up to 64Gb of class 4 microSD. The help desk gave me a picture of the camera head and the horizontal slot just below the lens. Looking into the slot, I don’t see a socket. I tried to plug a microSD into area with no luck, other than dropping it into the camera several times. Can this camera handle a microSD? If so, where and how do I plug it in? Attached is the picture provided by the help desk. Good morning Stan can you take a snap shot of the card your trying to use also If your camera dosent match the picture then the port may be on the board if it’s a different camera. 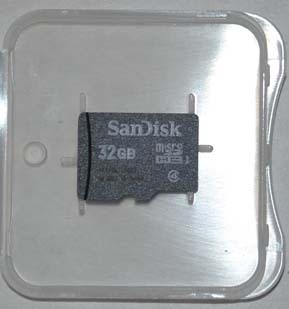 Attached is a jpg of the MicroSD card I am trying to use. I inspected the 2 cards and couldn’t see any socket for a microSD card. You will need a Class 4 Micro SD Card up to 64gb. The slot in the image is where you will need to insert the SD card. the right side where the letters are facing you should face away of the lens placing it slowly and pressing it until you feel the card push in on the small spring lock and complete the connection. If you don’t see the same spot on your camera it may be a different model. Can you please verify the model number of the camera. When I look at what is inside the horizontal slot, there is a metal piece screwed to another metal piece with no space between them. Good morning Stan we made a Mico SD installation video for the IPPTZ-EL2MPL12X-Mini-I here is the link. I solved the problem with my camera. I took the black ring around the lens ball off. I then took the semicircle black plastic enclosure over the lens (with the vertical and one horizontal slots) off. I found the MicroSD socket on the other side of the lens. I put the MicroSD chip in the socket, turned the black enclosure around so the horizontal slot is over the MicroSD socket, and reassemble the camera. This was an original assembly problem. The video in your previous reply helped.